Neuron-specific PERK inactivation increased demyelination and inflammation in the lumbar spinal cords of EAE mice. 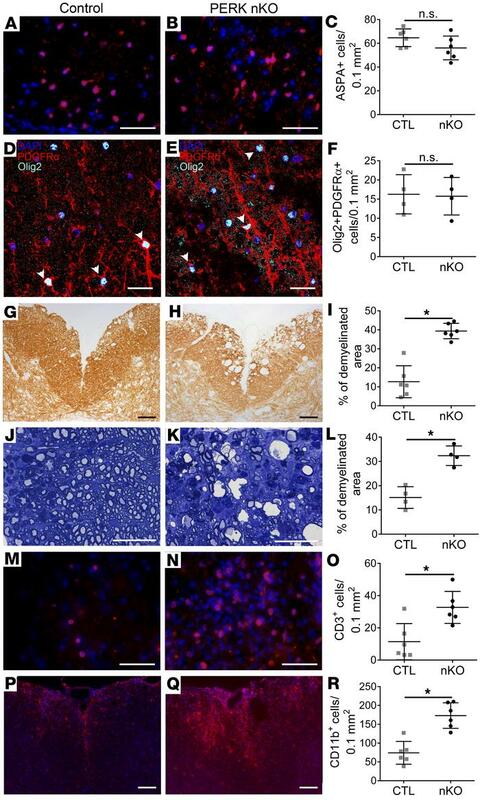 (A–C) ASPA immunostaining revealed that neuron-specific PERK inactivation did not significantly change oligodendrocyte numbers in the lumbar spinal cords of EAE mice at PID 38. n = 6 animals. (D–F) PDGFRα and Olig2 double immunostaining revealed that neuron-specific PERK inactivation did not significantly change the number of OPCs that were positive for both PDGFRα and Olig2 (arrowheads) in the lumbar spinal cords of EAE mice at PID 38. n = 4 animals. (G–I) MBP IHC revealed that PERK-nKO mice with EAE had a significantly increased demyelinated area in the lumbar spinal cord compared with that in control EAE mice at PID 38. n = 6 animals. (J–L) Toluidine blue staining verified that PERK-nKO mice with EAE had a significantly increased demyelinated area in the lumbar spinal cord compared with that in control EAE mice at PID 38. n = 4 animals. (M–O) CD3 immunostaining revealed that PERK-nKO mice with EAE had a significantly increased number of T cells in the lumbar spinal cord compared with that in control EAE mice at PID 38. n = 6 animals. (P–R) CD11b immunostaining revealed that PERK-nKO mice with EAE had a significantly increased number of macrophages/microglia in the lumbar spinal cord compared with that in control EAE mice at PID 38. n = 6 animals. Scale bars: 50 μm (A, B, M, and N); 20 μm (D, E, J, and K); 100 μm (G, H, P, and Q). Error bars represent SD. Statistical analyses were done with a 2-tailed t test, *P < 0.05.